ITP - What is it? Why do you pay agency fees? Nice, bright flat available for temporary rent in the Eixample district, Barcelona. 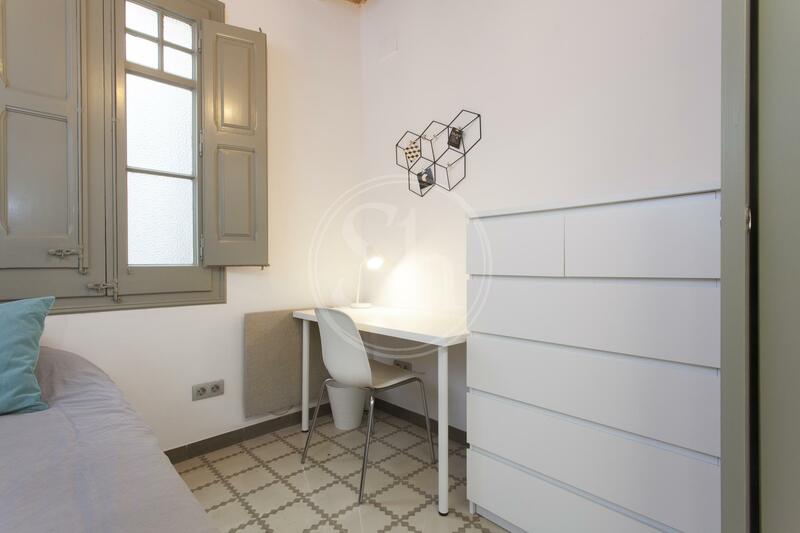 Completely renovated and furnished, this property comprises of three bedrooms and two bathrooms, each with study spaces. The first bedroom is a double with dressing room and a large ensuite bathroom with bathtub, the other is double with a balcony and the last a single. 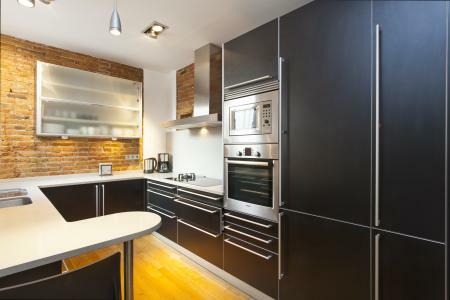 The independent kitchen is luxurious, it comes fully equipped with high-end appliances. The living room is comfortable, with a large window and access to a balcony, the dining room seats 5 people. 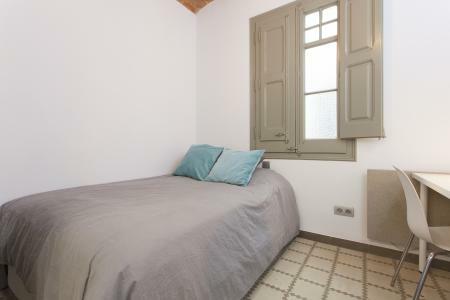 The property includes air conditioning, heating, internet and TV in the rental price. 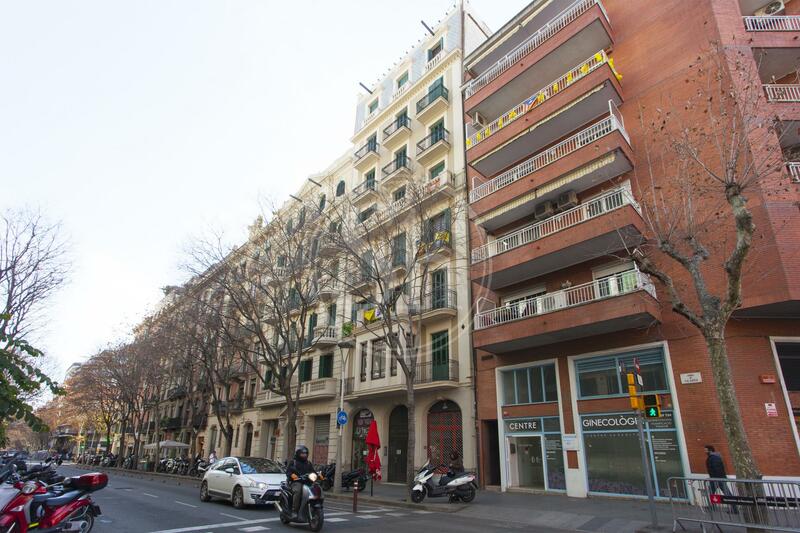 The building is located in Sant Antoni, bordering the Gran Vía de Les Corts. 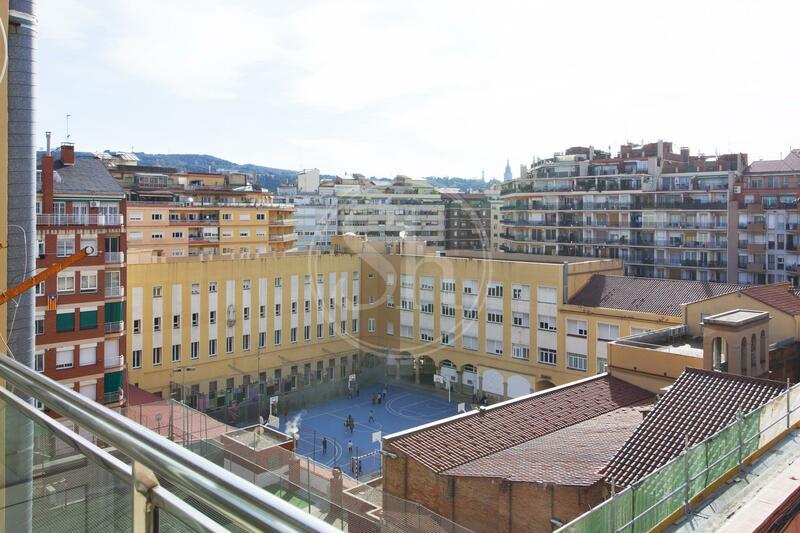 This lively neighbourhood is full of symbolic places that you should not miss, such as the famous Sant Antoni Market. 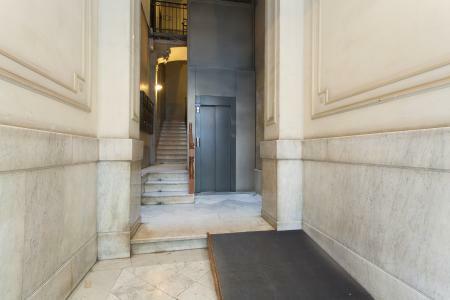 It is located close to Parlament Street, one of the most fashionable streets of Barcelona, near a fantastic cinema that shows films in their original version (Renoir Cinemas). This is an area full of life, offering the opportunity for a busy social life. In the vicinity, there are lots of different cultural and social activities and attractions to experience plus delicious restaurants, popular tapas bars and shops. This is the perfect area to fill your days and nights with activities that will help you make the most of a temporary stay in Barcelona. 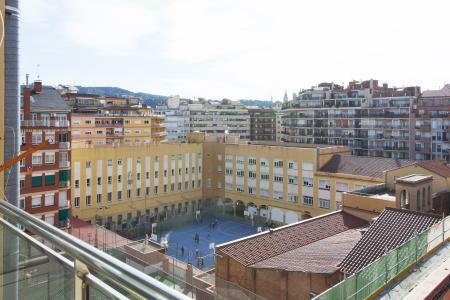 In addition, there is easy access via public transport to the entire city, the nearest metro station is Rocafort L1. We are recognized as operators of "habitatges d'us turístic". We are members of Apartur, of Colegio Oficial de Agentes de la Propiedad Inmobiliaria and also of Administradores de Fincas de Barcelona. All legal documents (reservation, lease contract, etc.) 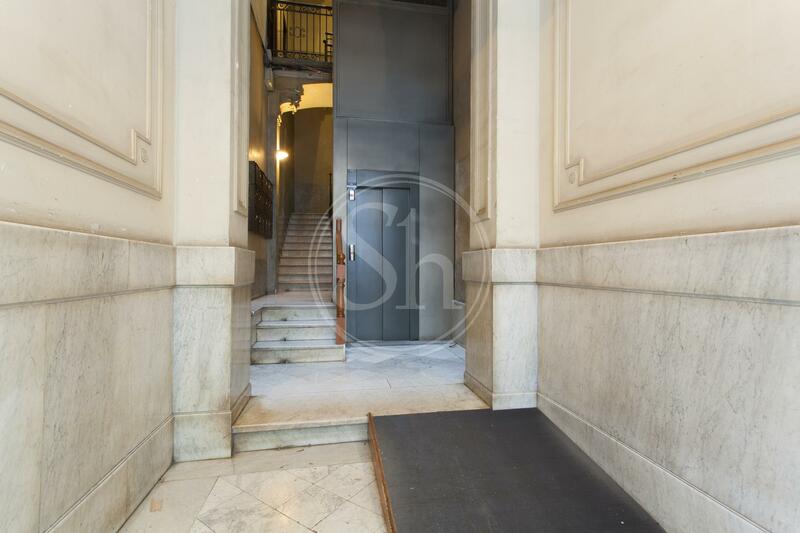 were drew up by the best known lawyers' office in Barcelona, in order to provide the best contractual security. * They are not certified translations, the valid version with legal effects will be the Spanish version. 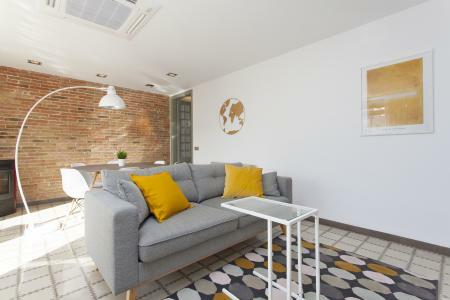 If the apartment does not have an internet connection, we will help you with the formalities (without additional cost from ShBarcelona) to instal it directly in your apartment. You will have at your disposal a ShBarcelona Key Account Manager who will be your contact during the duration of your lease contract. You can contact them directly by e-mail or by phone, they will help you with any subject regarding the rent or questions about the city. Maximum 48 hour after your arrival, your Key Account Manager will visit you personally to guarantee the proper functioning of the facilities, sign the lease contract, make the inventory and take note of the energy dispenser meter (which will start once you have arrived). We manage any incident and/or technical problem which could occur in your apartment during your stay. You will just have to contact your ShBarcelona Key Account Manager. We provide the emergency phone contact available 24/7 every day of the year for any emergency. The members of ShBarcelona were chosen for their human quality, their service vocation, and their knowledge of several languages, in addition to their knowledge of every apartment and/or district, which will help offering you the best option according to your requirements. We are at your disposal physically from Monday to Friday from 10 am to 7 pm continuously and on Saturdays from 10 am to 1:30 pm. In case of emergency, we are at your complete disposal by phone every day of the year, including holidays. 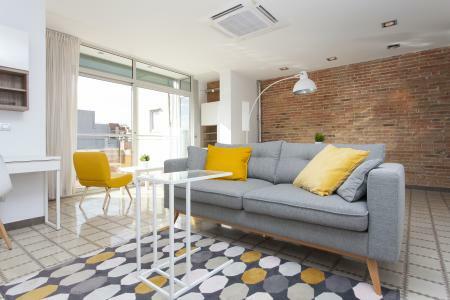 We know that renting an apartment is an important decision to enjoy your stay in Barcelona, we give you the possibility to visit any apartment* before formalizing your reservation. * If the apartment is available for a visit, if not, you will be able to access under certain conditions. We have a highly qualified, serious and punctual team, ready to solve any technical problem that could occur during your stay, in an optimal and effective way. We manage and check your bail, we act as an intermediary with the owner of the apartment. We guarantee* the recovery of your bail with clarity and transparency within 30 days on the bank account of your choice or via Paypal. You have at your disposal all the means of payment that the current technology offers: bank transfer, VISA, AMEX, Paypal. The rents can be debited on any European account following the SEPA system. Possibility to extend* your stay until 12 months maximum, you have the priority over any rent request of your apartment. * As long as you inform us 2 months in advance, and if the owner of the apartment agrees. We offer more than 1.300 apartments in Barcelona, all are ideally located so that you can find your apartment between 395€ and 3.000€/month. All were visited and selected by a member of the ShBarcelona team to make sure that they offer the best comfort. 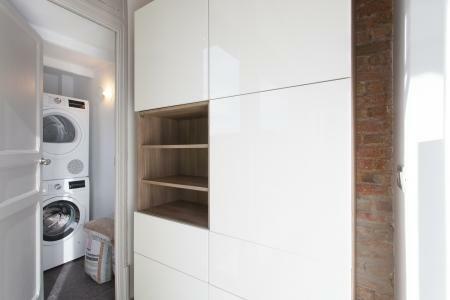 All published apartments are totally equipped and furnished with basics: washing machine, linen, kitchen utensils, cleaning kit, etc. 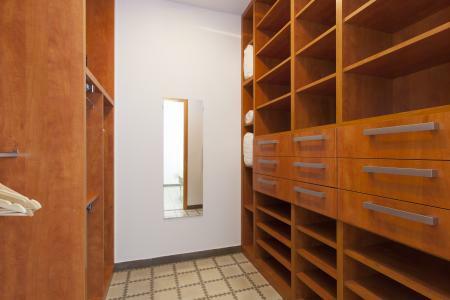 Before your entrance in the apartment, one of our quality service person will make sure that nothing is missing and that the apartment is in perfect sanitary conditions. A list of 50 crucial points will be examined to assure your well-being. We promise to repair or replace any defective equipment during your stay, free of charge* in 48 hours, provided that the item is available. * Provided that this is not due to a bad use of the tenant. Available in 9 languages, all the contents are translated by natives. We provide you tools to facilitate your search: variety of filters, alert system, favorites, personal account, fast identification of the apartments characteristics by icons, contact form according to your requirements. Our web page is updated in real time. All published advertisements give a description of the apartment, photographic reports and/or professional videos and a presentation of the environment, the localization of the apartment on Google Maps and Street view. We also provide you a system of geo-localization, it will help you knowing the distance from a point to another. We are at your disposal, you can contact us by e-mail, by completing the contact form on the website, by phone, through social media or directly in one of our agencies open from Monday to Friday from 10 am to 7 pm and on Saturdays from 10 am to 1:30 pm. You will be able to check the quality of our service on our social media by reading the comments of ShBarcelona's customers (tenants and owners). Every day more than 50 persons (bloggers, freelances, etc.) are working to find the latest trends of Barcelona, as well as many practical tips to prepare your arrival. 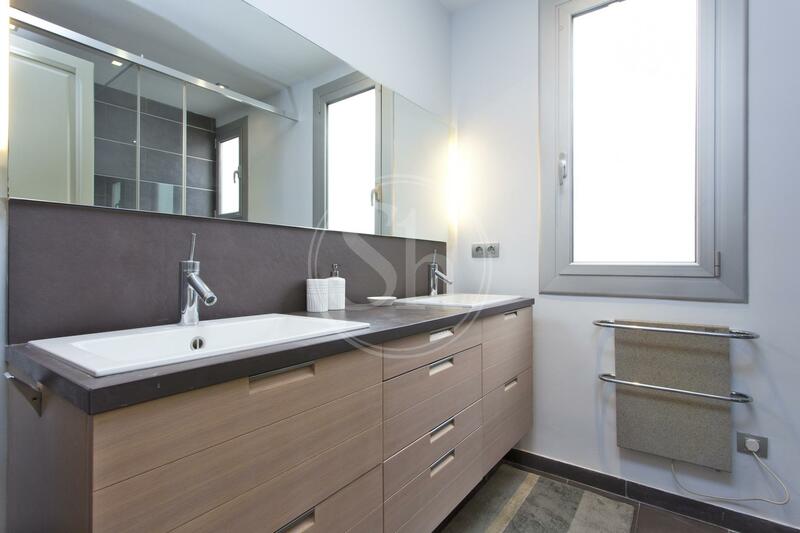 If you do not already know it, for guidance, you can expect an average of 700 € /m2, depending on the current state of the apartment and the level of the renovation works to do. If you do not already know, for guidance, you can expect an average of 150 €/m2. In "Yearly rental" a rent between 15 and 20 €/m2/month. In "Monthly rental" a rent between 20 and 30 €/m2/month. 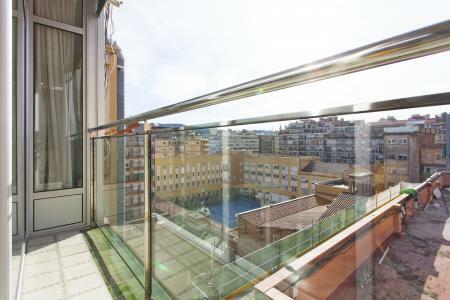 In "Short term rental" a rent between 28 and 40 €/m2/month. All estimates of the profitability simulator must only be considered as theoretical assessments, releasing the company ShBarcelona from all legal or commercial responsibilities. 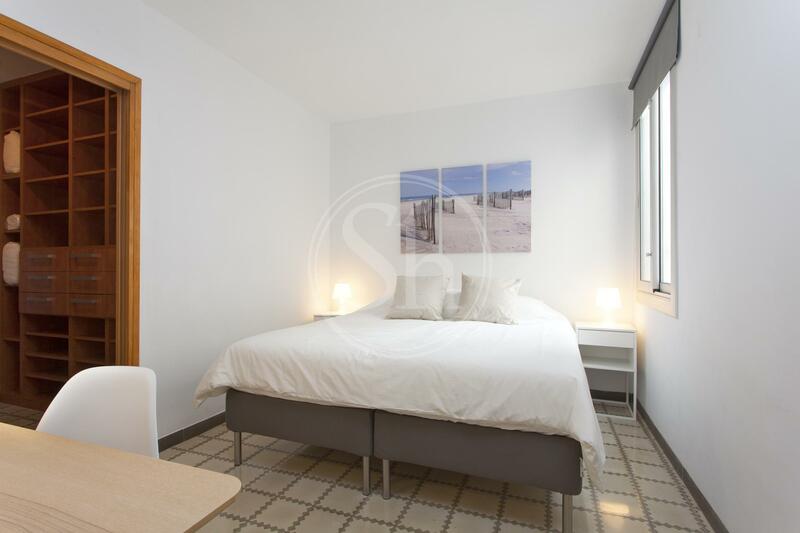 Select your flat - choose the reference of the apartment you like the most, letting us know the reason for your stay as well as your check in and out dates. 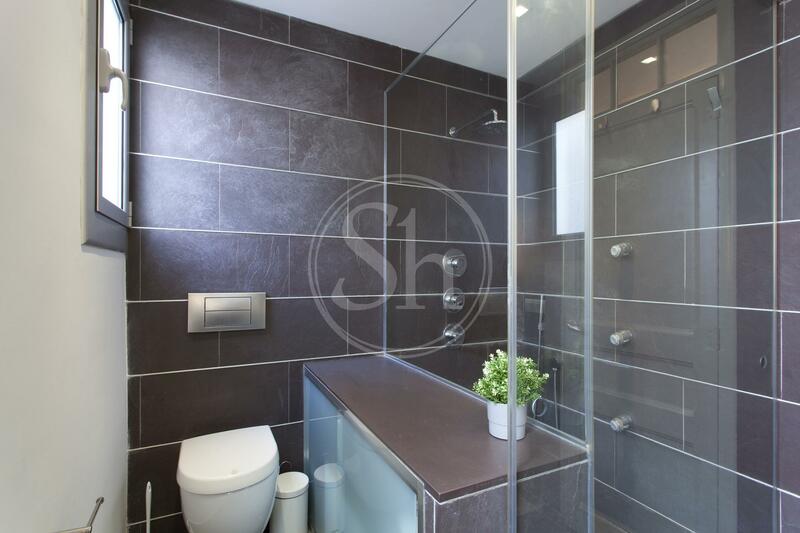 Contact ShBarcelona so we can confirm the availability of the flat and send you the specifications of your apartment. Optional: SEPA bank account (EEC). b. Copy of the last three payrolls. We will proceed to a personalized study. If you need to open a european bank account, we kindly recommend that you consider BBVA banc at Rambla Catalunya 98, letting them know you are a ShBarcelona customer. This process is quick and simple (10-15 minutes approx. ); you will only have to provide your passport to open the account. · Up to 4 months: 1 month’s rent +VAT [21% in Spain] -30% discount. 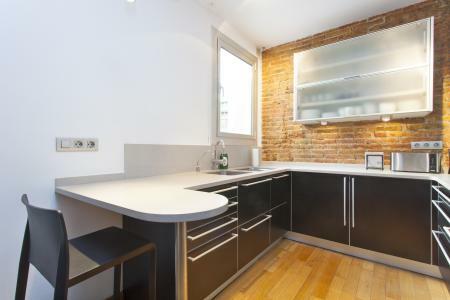 · The same conditions previously explained + the second month rent + corresponding amount of utilities. How to book the apartment? «Easy booking»: pay everything (current month’s rent + 2 months’ rent security deposit + agency fee). The only thing left to be done is to come to our office on your check-in date to collect the keys. «Two steps booking»: pay one of the 2 months rent security deposit in advance (which will be deducted afterwards from the whole initial payment) to book the flat, and pay the remaining amount any time before moving in. Our monthly rental reservation policy does not allow reservations to be made more than 12 days after the accommodation availability date. If you are in this case and you are interested in a specific property, contact us to consult directly with the ShBarcelona commercial team. How to pay the booking fee? Once the transfer is made, send the bank transfert receipt by email to your contact in charge of your booking, clearly showing the tenant’s name and the flat reference number. You can also use electronic payments methods, but in this case the following management costs will be apply: VISA MASTERCARD 1% on the amount paid, AMERICAN EXPRESS 3% on the amount paid; other electronic payments methods, consult with our commercial team. 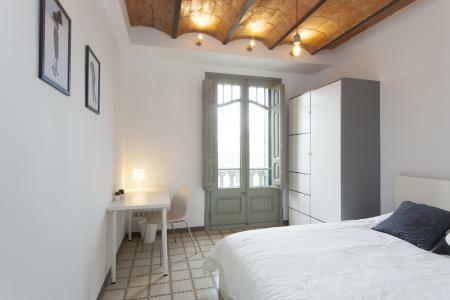 We will charge an amount from the second month of the lease depending on the bedrooms: 1 bedroom 75€, 2 bedrooms 120€, 3 bedrooms 160€, 4 or more bedrooms 220€. These payments will be regularized once the lease ends with the real expenses being made in the flat. ShBarcelona will notify you the result of your request within a maximum of 24 hours. The acceptance of your request will be decided by the owner. «Service Maintenance 24/7»: during your stay, you can use our 24/7 ShBarcelona maintenance service. They will be able to assist you and if is necessary will send a person to solve any problem that has occurred in the apartment. This service is free of charge. However, please note that if the problem is derived from misuse or accident attributable to the tenant, then the repair costs will be charged. 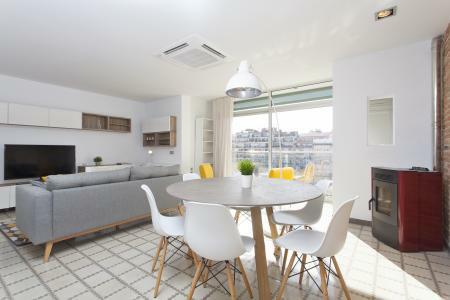 « Ready to move in»: all our apartments are furnished and equipped. All of them have a washing machine, bed linen and blankets; you just have to bring your personal belongings and your own towels. The apartment will be thoroughly cleaned before your arrival. 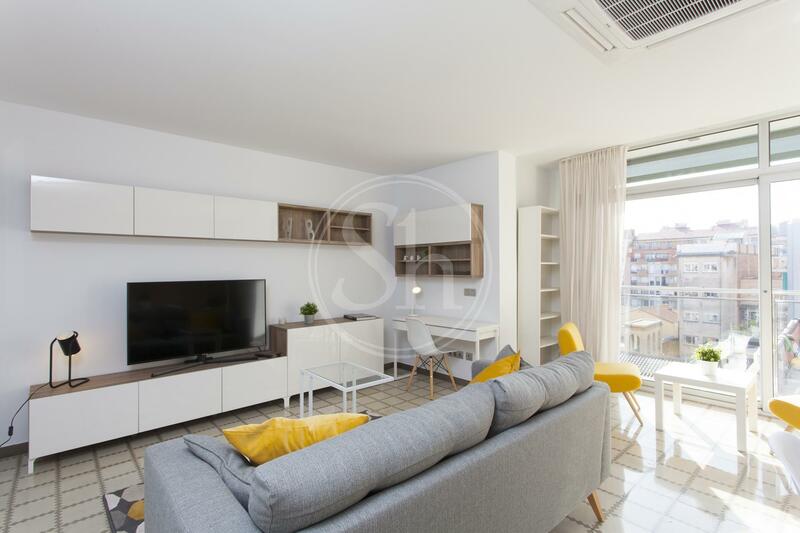 The final cleaning of the apartment is mandatory and will be charged to the tenant; the price is set according to the total area (m2) of the apartment. Our office, in Casanova Street 99 will remain open on Mondays to Fridays from 10am to 7pm and Saturdays from 10am to 1.30pm for the keys handling process. 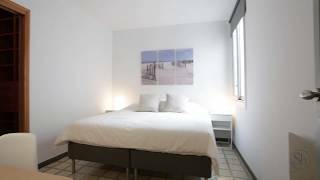 If checking-in outside of this schedule, the keys will be provided directly at the flat and 30€ extra will be charged till midnight, beyond that time: 50€. The owner of the booking is entitled to the full refund of the booking amount paid to ShBarcelona, if the contract is not finalized for reasons attributable to the property, without in any case, having the right to demand any additional compensation. In addition, it is important to keep in mind that although the apartments have insurance that covers water damages, fire and civil liability, this insurance does not cover damages or possible theft of your personal belongings. You can contact us to find out how to acquire insurance against burglary. Select your flat and contact ShBarcelona so we can confirm the 1 availability of the flat and send you the specifications of your apartment. b. Permanent address different to the one of the flat you intend to book. a. Last income tax return. c. Permanent address different to the one of the flat you intend to book. In case of rejection the total amount of the booking will be refunded. If you make the transfer on the day of the signing, you must bring proof of it. ShBarcelona will confirm as soon as possible the acceptance of your application, or will ask you for further information. Utilities are not included in the monthly rent and are chargeable to the tenant. The agency takes care of changing the holder of the contracts with the local suppliers. 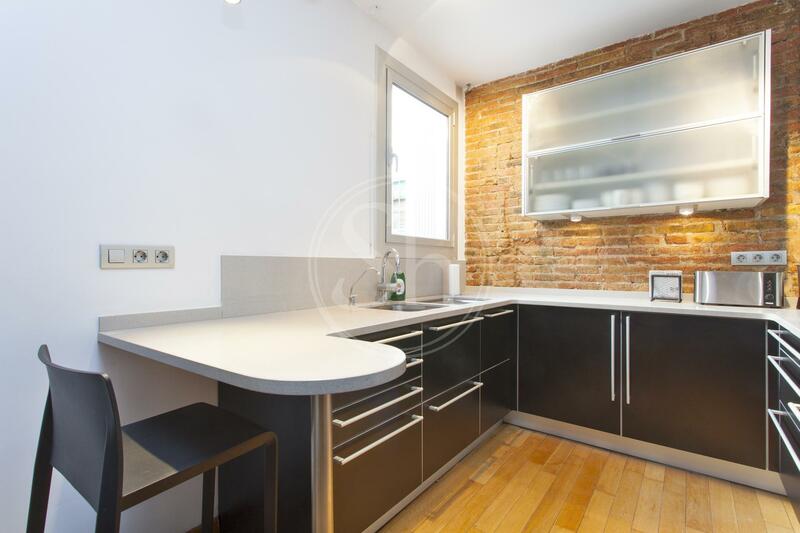 We will welcome you the day of your arrival directly at our agency located in Bailén street 200. We are open Monday to Friday 10 to 19 continuously. 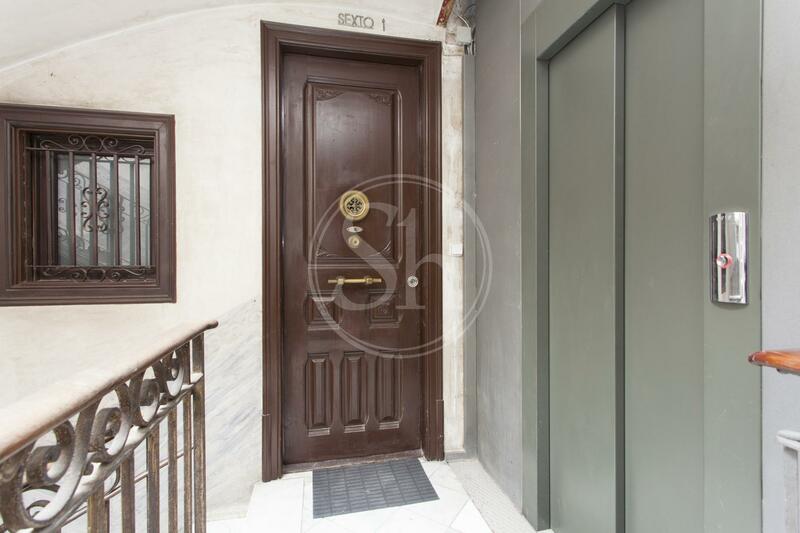 The handling of the keys can also be made on Saturdays 10 am to 1:30 pm in our agency located in Casanova street 99. Choose your flat on our website or directly at the office with a counselor, select the reference of the apartment(s) you like the most. Contact ShBarcelona for details and arrange a visit. d. We will transfer your offer to the owner of the apartment. b. The owner turns down your offer, your deposit will be refunded. c. Pay the outstanding amount of the apartment price. d. Documents needed: EX15 form in 3 copies, the copy of your passport or ID with original and copy of the Sale agreement. Formalize the sale agreement “Contrato de arras"
c. The law provides for obligations on the parties and regulates the effects of their eventual failure. 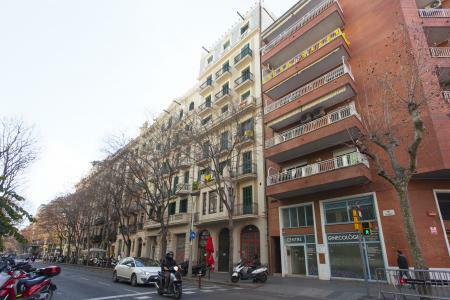 You must to inform Barcelona city hall for the change of ownership of IBI (Property Tax), that you must pay one year after purchase. What cost involves buying a flat? You should calculate approximately 12% pf the property price. That amount includes taxes (10% of the price), the notary time and registration of Deed in the land Registry. What happens if a party fails to meet its commitments? a. If the seller fails to fulfill its “obligation to sell” in the agreed terms, he must return the double of what the buyer has given him. b. If the buyer fails to fulfill its “obligation to buy” in the agreed terms, he will lose all the money already paid. As it shown on the contract agreement, you must contact us when you are close to your final destination. You have our contact numbers on the front page of this booking agreement. If you are travelling by plane, let us remind you that you need to contact us once you have recovered your luggage. If you are coming by car, please call us 30 minutes before your arrival. If you are travelling by bus or train, please contact us when you are arriving at the station. Our staff will not go to the apartment you rented until we receive information from you. Please take note that the agent responsible of your check-in can only handle you the keys once the balance is completely paid. Please note that an extra amount of 30€ will be charged for ANY check-in that takes place outside the following schedule: Monday to Friday from 15:00 to 19:00 or holidays. Warning, if you lose the keys of the apartment, an extra amount of 50€ will be charged. Make an imprint and a pre-authorization, therefore, the amount will not be charged and this pre-authorization is valid for 7 days. With this option you will be charged of an extra amount of 20€ to organize the deposit back upon departure. Please note that if you pay cash, the amount will be returned once it has handed over the keys and if the apartment conditions are satisfactory. The apartment must be vacated necessarily before 12 a.m. From this moment, the person in charge of the cleaning will proceed to prepare the apartment for the next guest. In any case the deposit will be refunded before you return of the keys of the apartment. You will be asked to leave the apartment in a reasonable condition and take out the trash and clean the dishes or else an extra cleaning fee will be requested. During the check-in, you will agree your departure time with our agent to facilitate the return of the keys. If you inform us about this fact 30 days or more in advance before your check-in date, you will be charged 50% of the down-payment as a cancelation fee. If you inform us about this fact within less that 30 days before your check-in date, that will exclusively imply the loss of your down payment. In the event of a breach in the booking agreement by the company, the same cancellation policy will apply. ShBarcelona reserves the right to change information published on the site at any time including rates, descriptions and photographs. ShBarcelona makes no warranty or representation about the fitness or suitability of any product or service advertised on its web site. The client will inform ShBarcelona of the number of guests included in the booking. Unless otherwise authorised by ShBarcelona, only the number of persons indicated by the client during the booking process shall be authorised to use the apartment. The number of persons who may use the apartment may not exceed the number of persons for which the apartment is supposed to be used, except for children under two years of age. Pets are allowed only when permission has been granted. 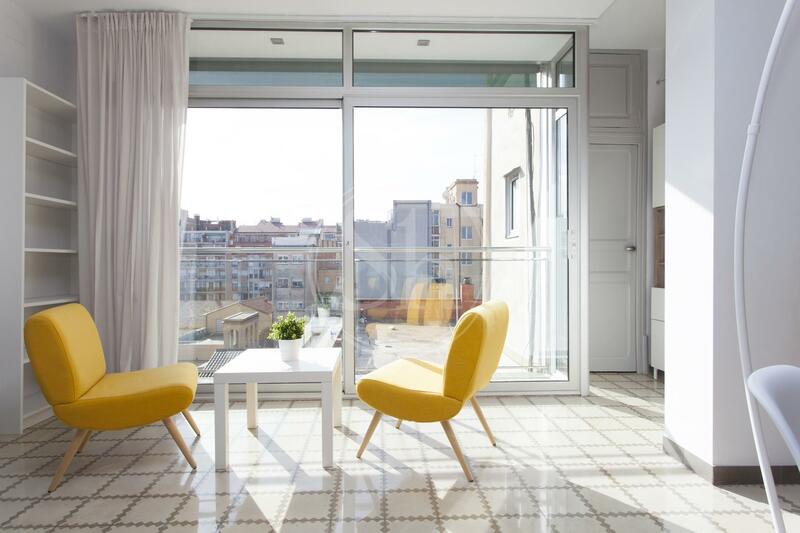 In the event of any infringement of the aforementioned obligations, ShBarcelona at its sole discretion will be entitled to request the client to leave the apartment, without offering any type of compensation. Disturbances, excessively loud music and parties are very clear: all are strictly forbidden. 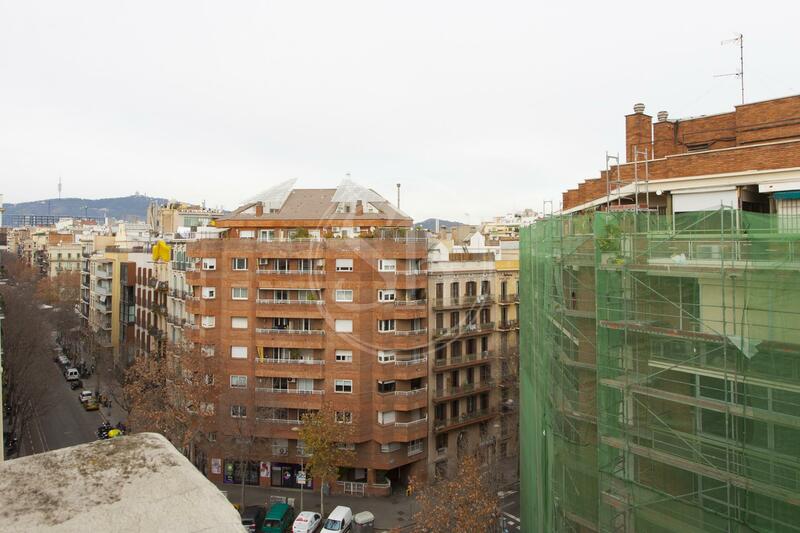 Guests staying in an ShBarcelona apartment should know that if parties are held or havoc is caused, or if the neighbours complain they may call the police and this can result in immediate eviction regardless of the time of day or night and it could represent having to pay a fine. The client signing the check-in form will be responsible for the correct behaviour of all the persons accompanying him or her. Failing to comply will result in loss of the prepaid rent and refundable damage deposit and we will not give any type of compensation. Also note that by booking with ShBarcelona you have already accepted our terms and conditions and will therefore be expected to abide by these rules. You will also be expected to sign these rules upon check-in on your arrival day. Quiet time is every day from 22.00 PM to 8.00 AM. We appreciate your collaboration in this matter and hope you understand that these rules are necessary as these apartments are all situated in residential buildings where people have to live and get up for work early. Nightly rest of these inhabitants must be respected. 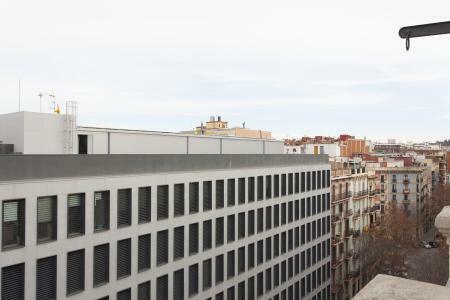 Neither ShBarcelona nor the owner of the apartment shall be liable when a guest damages the apartment, when there is a loss because of a fire, when the place is robbed or if there was any other criminal behaviour. Thank you, your request has been sent successfully. Our commercial team will contact you as soon as possible.